Celebrating 25 years of service to the Houston community! Benefiting: El Centro de Corazón, an accomplished Federally Qualified Health Center (FQHC) with four health center locations in Houston’s impoverished East End, provides a comprehensive range of healthcare services for low-income children and adults. 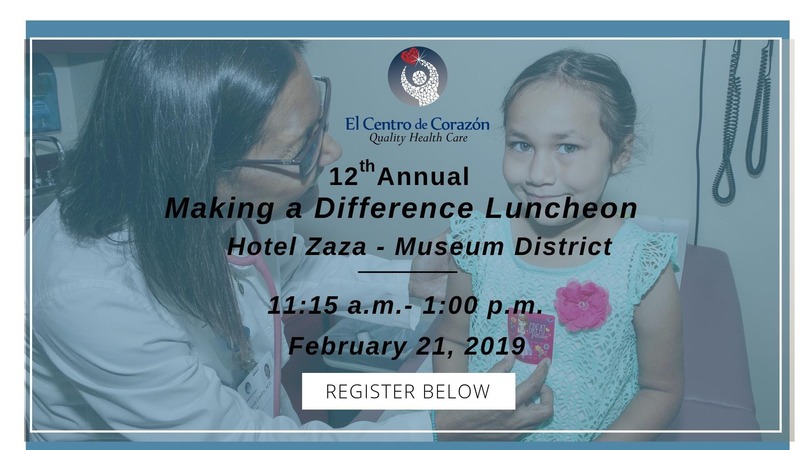 El Centro will celebrate its 25th year of service to the Houston community through its Twelfth Annual “Making a Difference” Luncheon, with proceeds being utilized to provide quality medical, dental and behavioral health services for vulnerable and underserved individuals and families. Registration for the 12th Annual Making a Difference is now open! Join us on Thursday, February 21, 2019, at Hotel ZaZa. Don't Miss This Special Event! * Individual tickets will be sold at a later date.